Sitting in the very heart of bustling, noisy Shanghai, Yuyuan Garden is an oasis of peace and comfort, with its glittering pools of goldfish, lush pine trees, fine rockeries and delicate kiosks. It's a top attraction in all the tourist brochures, but its true value may be deeper and more hidden than what a casual visitor can appreciate. The history of this fully preserved ancient classic garden is tightly interwoven with Shanghai's fortunes over the past 450 years. "People normally think the garden is all about the Nine Zigzag Bridge and the Mid-Lake Pavilion, but it's a lot more than that," says Zang Ling, management director of Yuyuan Garden. The garden was first built during the Ming Dynasty (1368-1644) by Pan Yunduan, a high-level government official, as a gift to his parents. Over the years, it was expanded to include more water features and elaborate architectural structure. In Chinese, yu literally means "peace and comfort." Construction work on the garden lasted more than 60 years, from 1559 to 1620, and much of the design is attributed to the famous landscape architect Zhang Nanyang. Pan's father died in 1582, so it was Pan himself who came to enjoy the garden on his own retirement. He invited opera troupes to give performances and held kite-flying events, cricket fights and religious services in the garden. Pan's extravagant entertainment and lifestyle quickly drained the family fortunes. The garden changed many hands after his death. In the Qing Dynasty (1644-1911), Yuyuan Garden underwent renovation by rich owners several times, and it eventually became a club and recreation center for Shanghai's elite. The garden has also suffered the destruction of wars. During the Opium War in 1842, the British army set up a headquarters in the Mid-Lake Pavilion. In 1860, foreign mercenaries hired by the Qing government to fight local rebels destroyed rockeries in Yuyuan Garden, drained the ponds and erected Western-style barracks. During the War of Resistance against Japanese Aggression (1937-45), invaders torched some of the garden pavilions. Still, the garden survived, and its history is marked by multifaceted uses. In the early 1900s, the garden was headquarters for various Shanghai industrial and commercial associations, all competing in efforts to refurbish the garden. In the late 1980s, the garden underwent a series of renovations that restored architecture to its former glory. "The garden is a masterpiece of ancient Chinese architecture, but it is also a centerpiece of Shanghai culture and identity," director Zang says. "If you don't visit Yuyuan Garden, you don't visit Shanghai." 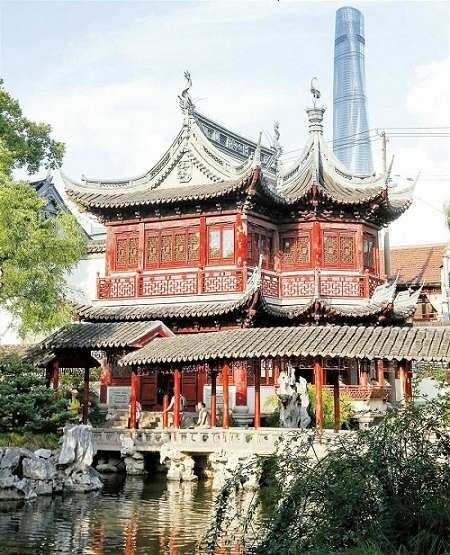 Like a typical classic Suzhou-style garden, Yuyuan is small, at about 2 hectares. But it is perfectly arranged with pavilions, towers, rockeries, paths, lakes and plants. Surrounding the garden is a lively area of bazaars, restaurants and old-style lanes. Small wonder that Yuyuan Garden is now the most popular tourist attraction in Shanghai. The Nine Zigzag Bridge leads to the main entrance of the garden, where visitors are first greeted by the spacious Sansui Hall. It was a place for holding official ceremonies, announcing imperial decrees and hosting gatherings of celebrities. The window frames and beams of the building are delicately carved with patterns of corn, rice, wheat, sorghum, fruits, pines and cranes — symbolizing the wish for abundant harvests, good fortune, longevity and happiness. Behind the hall stands the two-story Yangshan Pavilion, looking out over the Huge Rockery in the near distance and a pond in between. The rockery, almost 14 meters high, includes the largest existing yellow stone in the region south of the Yangtze River. There's a winding path to the top of the rock hill.